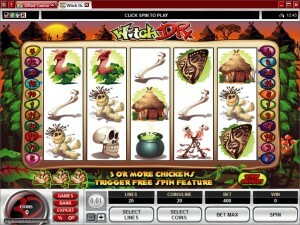 The action in Witch Doctor is a perfect fit for someone that is looking for a slot to play during Halloween. It’s inspired by Voodoo, and you’re going to see a lot of things from this religion, including the chickens that are waiting to be sacrificed, the Witch Doctor looking like a tribal priest, various potions and puppets with needles sticking out. 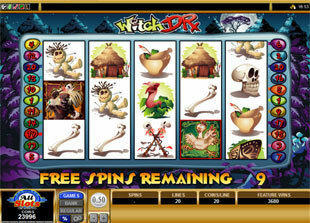 In short, this is your typical Voodoo themed slot and a game with a good design. The slot is average in a lot of ways, but that’s not a bad thing since it means that you’re getting all the things you expect from modern titles. 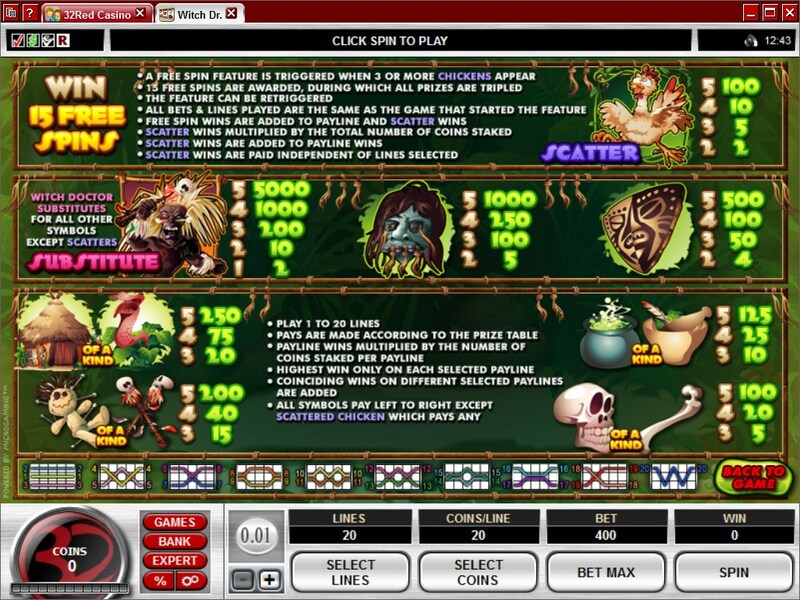 There are wilds here, scatter symbols, free spins and multipliers, plus the layout has 5 reels with 20 bet lines on them. The payout is way above average though, giving you $50,000 if you’re really lucky. You’re not going to be surprised by anything that Witch Doctor has to offer. 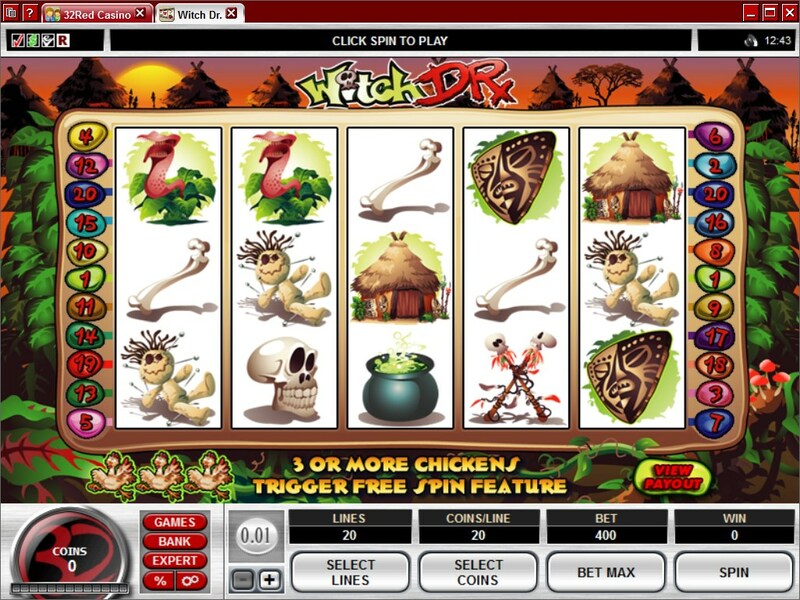 Most modern slot machines have the same combination of wilds that can award the top jackpot, of scatter symbols which award prizes and which also give you free spins with tripled multipliers. First, the Witch Doctor symbol, which is used in the game as a wild feature. What you can expect from a wild is that it will use its substitution ability to take the place of a regular symbol, whenever it lands in a spot where it would be needed. A new combo will form if the wild does this, and you get a prize which couldn’t have been possible without it. The wild is also useful when it forms its own combinations, awarding the top jackpot when occupying an entire line. The Chicken scatter is the other big symbol that Witch Doctor relies on. The main property of a scatter is the ability it has to appear anywhere on the reels. No matter in what position the symbols land, you get paid and you get free spins as long as the requirements are met. You need two or more Chickens present to get a cash prize, with the maximum of five symbols bringing you the biggest value, of 100 times the bet. Like it happens in most cases, the scatter symbol is also responsible for triggering the free spins. At least three scattered Chickens need to appear during a round, and if that happens you get 15 spins for free. The prizes awarded during free spins are always tripled, a x3 multiplier applying each time to the win. You can retrigger the spins with the same 3+ symbols with Chickens. You’re not going to be happy with the maximum bet possible in this game, which goes as high as $200. You can spend just $0.01 per line if you want to, which is the smallest value of one coin, but the prizes will be very low as well. Up to 20 coins may be used for each bet line, with their top denomination being $0.50. That means a line bet of up to $10. The game gives you only a 5,000x return on your line bet investment, but since the wagers can go up to $10 per line, that’s $50,000 cash that you can win. You get a scary vibe from this game, which is quite normal when you consider the Voodoo religion which served as inspiration. The action takes place in a village, with some huts visible behind the game area. On the reels, there are symbols which are connected in some way to the religion or the way of life of the people that embrace it. There are human skulls, cauldrons with boiling potions, Voodoo dolls with pins in them and all sorts of other symbols that you will definitely not find cute. Symbols: Witch Doctor (5,000x, wild), Chicken (scatter, 100x the bet), Shrunken Head (1,000x), Mask (500x), Grass Hut (250x), Plant (250x), Voodoo Doll (200x), Juju Sticks (200x), Cauldron (125x), Potion (125x), Skull (100x) & Bone (100x). The Voodoo angle I’m sure that will be quite popular, as is the case with the features, the design style and the top prize. 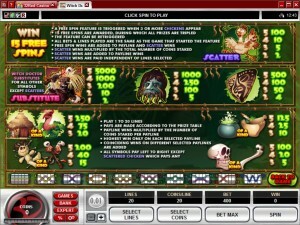 The bets can get rather expensive though, more so than the majority of the slots offered by Microgaming. The Witch Doctor slot machine is offered through the Microgaming platform, so if you want to play it for real or just to practice, look out for casinos that use it.